When Zoella first announced that Penguin Random House had approached her, offering a book deal, I was a little bit disheartened. As someone who's dream is to become an established author, I know the struggles that first-time authors face when trying to get their hard work published. J K Rowling was famously rejected by a whopping 12 publishers before anyone took an interest in Harry Potter. I find it completely frustrating that people who have a bit of fame can just get a book deal like *snaps fingers* that! It's not Zoe's fault whatsoever - it's just the way the world works! With that being said, I tried to be happy for Zoe and her success; I knew the book would do well, because of her army of fans/minions/loyal followers. Can I say now - I don't dislike Zoe whatsoever, I honestly don't. And the book did do well, being the "best selling debut novel since records began" - but that doesn't mean it's a good book, and that's what I've said from the beginning. There was never any doubt that it would do well in terms of sales, because she has so many people who are willing to buy anything that she puts her name to. I remember when Zoe made the first announcement about Girl Online, and how she told the world that she's been writing stories ever since she was little and how much this was a dream come true - in my mind, someone who says something like that is someone who's going to write every word of their debut novel, at least until it gets to the editing stage that every book goes through. Rumours were circling the internet for the past week about Zoe's book being ghost written; I felt a bit prickly about it, but decided to ignore it. I asked my university tutor (who is head of the Introduction to Publishing module on my course) if there was any way of finding out for sure, but he said no. It came as a huge surprise when it was announced HERE that it actually was "ghost written". I'm not saying everyone should believe everything the papers say, and I know that ghost writing happens more often than you or I can imagine. But at least Katie Price doesn't hide the fact she didn't once put pen to paper. I am genuinely upset that Zoe's not been honest with the people she claims to love; I am genuinely upset that a) it is so easy for people with a bit of fame to get a book deal and b) it is so easy for people to lie about what they have or haven't done. Zoe has made a statement on Twitter regarding the allegations; but at the end of the day, you can rest assured that Penguin would not have mentioned anything if had just been an editor or mentor that she'd had "helping" her - because all authors do, it's part of the process of publishing ANY novel. There are a lot of statements pointing towards the book being ghost written; it doesn't make Zoe a bad person, but in my eyes, honesty is golden. It's one of those situations where it's hard to collect your thoughts coherently. Finally, I have to say that everyone is entitled to their own opinion regarding this situation. If you are 100% supporting Zoe's actions & choices then good for you, it won't change how I feel towards you - so please don't get annoyed at me for stating what I think on the matter. I hope this post hasn't offended anyone! This post is solely my own opinion. The information is correct as far as my research shows. Please don't hate me, but I had to get my thoughts down somewhere. What do you think? Let me know. As someone who has always wanted to write a book and as someone who blogs beauty, I expected her to get a ghostwriter. Realistically in the amount of time she was given there was no way she would be able to write anything worthy of printing in that amount of time unless she has been compiling things for months or years. She had to have someone write the book but I figure it's probably like a lot of celebrity collaborations. You work with a team, you give them an idea and then you let it go letting your team decide the direction to take your product or dream. I think people who will find this disappointing are her younger fans, who maybe didn't realize this before purchasing it. Would she have gotten a book deal this early if she didn't already have a market? Maybe. But maybe not. I do wonder though if she'll score another book deal since her first week's sales did so well! Would be interesting to see how that plays out. I think someone who has always wanted to write a book would definitely be someone who WOULDN'T get a ghost writer - plus she could have written it and just extended the time scale of the project, but apparently these things are all about money! Her deal was a two-book deal so we will have to see what happens with the next one! No I've felt the same about the book deal she was given. 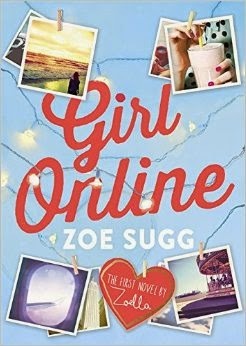 I felt a little more bitter after seeing Zoella's first few blog posts and seeing how badly they were written, considering she was 19 at the time. At the same time, I feel awful for judging her because, I agree, it isn't her fault that all of this has happened, and although she wasn't honest about the help she received, she remains to be one of the better role models for young girls out there. I've got the book to support her and to see what the fuss is about but haven't made a start as I just think it was a bit overhyped - it's not totally fair on those who've been literally working all their lives towards something like this. I'll definitely start reading it after Christmas as I'm also interested to know how much it sounds like her life, even if she said it wasn't based on her. I am a little disappointed she's not been honest, particularly for her younger fans.. I know a 12 year old who is beyond excited she has a book and how upset she'd be if she knew Zoe didn't really write it. Your thoughts echo mine completely. Again I like Zoe she comes across as a really lovely person but I was disappointed when I heard she had a ghost writer after what she initially said about loving writing and always wanting to have her own book. She should have been honest with her fans, as she is a role model for many young girls. Ghostwriting in general infuriates me. I also hate how casual they're making writing books these days. Like anyone who has a little fame can just casually sign a book deal, have it written up and published in a few months, and then boom - it blows up and everyone in the world buys it. Being an established author takes real talent!